The music streaming service Spotify today announced new features centering on music discovery and artist interactions for its users. Daniel Ek, CEO and founder of Spotify, said at an announcement in New York that the company’s new products were the direct result of user feedback and requests. Spotify’s start page will now open under a new “Discover” tab. The revamped design is made up of tiles with artists’ pictures, short blurbs on their music and information on upcoming concerts, with content sourced from sites such as Pitchfork, Songkick, and Tunigo. In addition to its other changes, Spotify added Metallica’s albums and songs to its library today. The look and feel is reminiscent of the content-sharing site Pinterest. Ek said that while many users came to Spotify to listen to music they know, they complained it was more difficult to discover new music. To that end, the service now makes music suggestions based on users’ previous listening choices. These appear as tiles on one’s homepage. 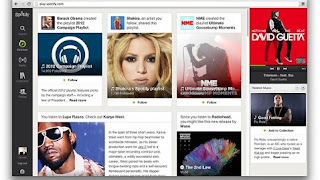 Music suggestions are also made in real time, based on what users are listening to at that moment. Another way in which Spotify hopes to foster a more intimate fan-artist relationship is with mobile push notifications, which will immediately alert users when new tracks become available from artists they follow. “Now artists can talk back to fans. For the first time, artists can send new music directly to subscribers’ devices the second it drops,” said Ek. Spotify’s new features are currently in so-called beta testing, and will roll out for all users at the beginning of 2013.